This article ran in the print edition of The Advertiser on May 7, 2008. September 7, 1898, Mamie Julia Lewis was born. 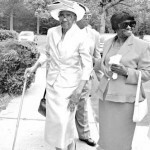 On the day of the celebration of her continuing life, May 3, 2008, at Springfield Baptist Church on Highway 25 in Edgefield County, the now 109-year-old Mamie L. Rearden, married with children –11 by birth and two through faithful nurturing – stood poised, well aware of the afternoon before her, to walk into the church with children at her side. Dressed in a characteristically fashionable hat and pink suit that fit her tall, statuesque frame in folds of silk, she entered the church to hear of her remarkable life. Modest in her intake of the event, and “quiet” as those who spoke characterized her manner, she heard from ministers, sisters-in-the-faith, daughters and sons of the family bits and pieces of her life that helped those in the audience to understand the tenacity of her years. It was noted that she came into the world in time for the dawning of the twentieth century, and, with her years spanning that century, she is now “a woman who has lived in three centuries,” as her daughter Sarah, a Washington, D.C., lawyer, said in her remarks to the audience. 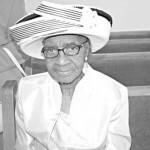 Characterized as a “mama, grandmamma, friend, educator, church worker, Mother of the Church, deaconess and choir member,” it was also noted that at age seventy she undertook to enter the work force again as a caseworker with an agency. She attended a small rural school before graduating from Bettis Academy, In 1918 she entered a teaching job at Faulkner Mountain School, married (for 59 years) in 1919, and continued to teach until she and her husband decided she needed to stay home with their children. One of the speakers giving tribute was Ms. Willa Lanham who gave a roll call of her children, seeing them as products of her upbringing, and like fruits of a tree, were of the quality of the mother tree. As their names were called they stood: David, Elijah, George, Joseph, James, Timothy, Martha, Mary, Ruth, Sarah and John (deceased). “Notice, all their names but one are Biblical. That one is the name of a former president of the U.S. (George),” stated Ms. Lanham. Others who spoke during the tributes were: Rev. J. C. Williams of Augusta who had come to know the family while in the military when he was served by one of her grandchildren in a dental capacity; David Rearden, retired military. Her motherhood was praised in the light of always being the mother, not a friend or peer, which gave her children true understanding of authority. David Rearden stated that even in these later years, when a child might admonish her to eat better, she would retort: “Who do you think you are talking to; I am your mother.” Another of her values was the Goldern Rule, “Do unto others. . .,” something she has attributed to the lasting of her life beyond the usual years. “A good value system,” “quietly and with commitment” and “respect and godliness” were attributes heard time and again. Senator Massey was on hand to present a resolution entered into the minutes of the General Assembly of S.C., honoring her long life. This and other tributes handed her were preliminary to the festive meal and commemorative cake holding her image that followed in the fellowship hall. Mr. Harrison Rearden of Columbia spoke of Mrs. Rearden on Sunday as his mother, though she is not his birth mother, “but she treated us no different.” He is one of the “13” though she gave birth to only 11. To know more about this special afternoon of tribute, read Ethel Butler’s report of the day and the report of Mrs. Rearden’s taking the podium to speak for herself! On Saturday, May 3, at 3 p,m., the pastor Rev. Craig Myers and the Springfield Baptist Church members, honored Mrs. Mamie J. Rearden with an awesome Appreciation Program. 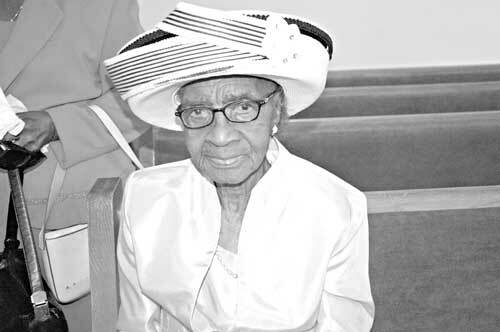 Since this great lady is Mother of the Church and the oldest member, her pastor wanted to give a special honor to her longevity and service to the church, community and family. She was born Sept. 7, 1898, and will soon be celebrating her 110th birthday. She is truly a super centenarian! How do you describe, Mrs. Rearden? Well, at the start of the program, this lady walked down the aisle escorted by one of her daughters, Mrs. Mary McCain and son Mr. David Rearden, her head and body erect, regal like a queen — she even gave her cane to someone else to keep for her, as she walked to her seat up front. She was dressed in a lovely light pink suit and a gorgeous hat, white with little stripes. She was simply beautiful and certainly doesn’t look her age. The program began with Mrs. Dorothy Ryans introducing the Mistress of Ceremony — Mrs. Lunette G. Patten, who did an excellent job guiding the program form start to finish. Scripture by Trus. J. Ryans was taken from Proverbs 3:1-6. Then there was one of several beautiful selections, by the musicians for the program. Dea. Joshua Hillary – “I’ll Do Your Will.” Sis Mary Williams warmly welcomed everyone. Rev. Patten prayed a very touching prayer, fit as always for the occasion. Among the many presentations was a resolution presented by The Honorable Shane Massey, South Carolina Senator. There was also a resolution, presented to the Honoree, Mrs. Mamie Rearden, by Representative William “Bill” Clyburn and Beverly Clyburn. 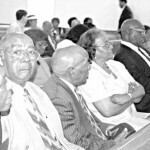 He stated that they were looking forward to having her in Columbia also for a centenarian honor. Records are being checked. She may even be the oldest living S.C. citizen. After presentations, many tributes to the honoree were given by family and friends. Excerpts from a few – appreciative remarks from Rev.J.C. Williams who spoke of her giving examples from Ecclesiastes 1 concerning her wisdom. Sarah, the baby girl, gave so many good attributes about her mother. She took us back a bit by reminding us that when her mother was born before Hwy. 25 was paved; reading was done by lamps, people shared with each other, loved each other, they as children were taught to request, love, share and to be obedient. She said their mother not only told them what to do but lived a good example before them. Quite a remarkable lady. Son – David began his tribute with Proverbs 31:10 and Timothy 2:8. He thanked his mother for the love and discipline she gave him and his siblings. Most of all for maintaining a mother’s role in keeping with the scriptures. Bro. Harrison Rearden talked about the great influence (lifetime) his aunt and uncle Rearden had on him and his brother. He said they had a value system of integrity, morals, shared wisdom with a strong sense of spirituality being the governing agent. He saluted her diligence, faithfulness and servanthood. Sis. Willa Lanham reflected beautifully her observations of the honoree. She stated that she applied the Golden Rule to life; that a tree is known by the fruit it bears; with that Mrs. Lanham had all of the Rearden children to stand and pointed out their successful lives as productive evidence of this God fearing woman. A beautiful solo by Dea. Robert Nelson “I Made It”… set the pace for more reflections by family members – Son Jasper sang “How Great Thou Art” and mentioned that there would be a change in many young ones’ lives if adults would kindly teach them when they are wrong. Her daughter-in-law gave praises to her for being such a nice mother-in-law Mrs. Mamie Rearden’s grandchildren Chrisantha, Jacque, Kai and Sol presented her with roses. The pulpit aid – Dea Mack Ryans and Rev. Myers made their presentations a beautiful cake with her picture in the center. It was beautifully designed and baked by Mrs. James Smith, Jr. Other tributes and flowers were made by friends and relatives. Her son Elijah stated what a joy to be raised by a mother like her. Oldest son, James, from Philadelphia, also stated he has a lot to be thankful for to have had great parents and a great mother like her. Ruth and Mary also talked about their mother as they reflected on their childhood days and the manner by which their loving mother and father raised them. All of her children had something loving to say about their mother and the influence of her life, how it shaped their future. The guest preacher, Rev. Nathaniel Irvin, pastor of Old Storm Branch Baptist Church, was introduced by Rev. G.L. 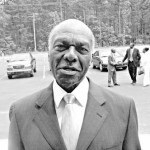 Brightharp, pastor of Mt. Canaan Baptist Church. Rev. Irvin spoke briefly and very eloquently from Matt. 5:13. 16. Salt he stated that the life of Mrs. Mamie has been “Salt” to the family. She’s reflected a Christ-like walk in her life. She shared with others and taught them to share and demonstrated the right frame of mind. Then came the moment we had all waited for the remarks from the honoree herself. She admonished all that we will have better if we live respectful lives and treat others like you want to be treated, that she’s always tried to live and to do her best. She said that all said about her, was not a “story” but true. She appreciated everything that everyone did for her. She gave thanks to her pastor, Rev.Craig Myers, her children, church family and everyone for thinking about her. Her family expressed their appreciation for all of the beautiful tributes made to their mother. Many pastors from near and far were present. Rev. E. Lloyd was the spokesperson for the clergy. Rev.Myers gave his remarks and thanks and recognition to the committee who worked on the program. After the benediction by the speaker, the guests were invited to a delicious fellowship dinner with the honoree Mrs. Mamie Rearden, whom I am most honored and blessed to be a relative of. What a wonderful afternoon to spend in the company of many, many cousins and friends. Congratulations again and again.!! 2 Responses to "Repost: In Her 110th Year – A Mother is Praised"
I WISH I COULD HAVE MET HER, JUST FOUND OUT SHE WAS MY COUSIN(WHAT A SMALL WORLD).